Jasper National Park is the epitome of Canadian natural beauty. Vast landscapes of mountains, flowing rivers and evergreen forest blanket the region and the wildlife here is king. Larger and filled with more untouched, rugged wilderness than Banff, I think I just found my favourite place in Canada. Many people however, avoid Jasper in the winter months and not without reason. 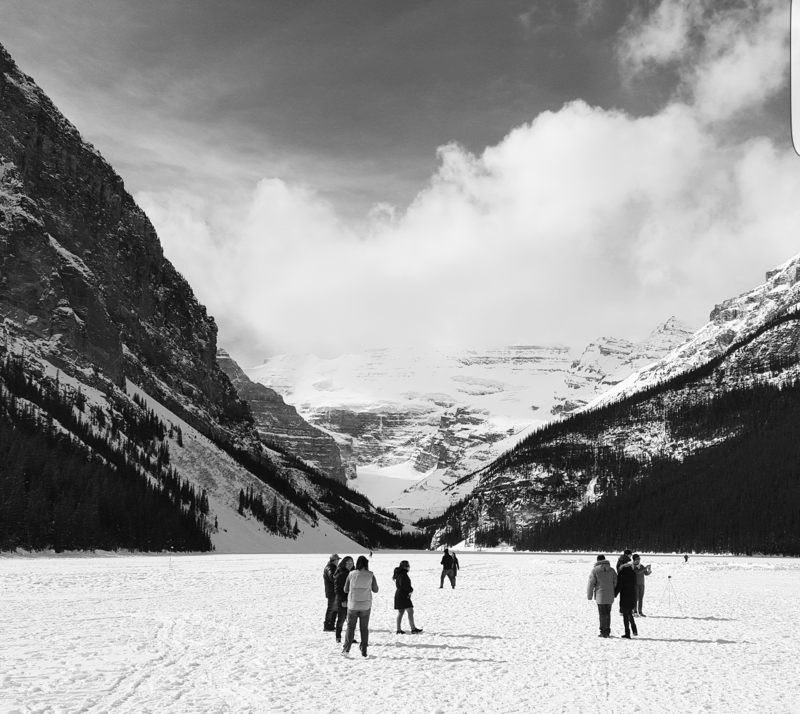 Even getting there proves difficult, as the main route to Jasper through the Icefields Parkway becomes a treacherous, icy, avalanche-prone zone. Then even once you are there won’t be as much wildlife out and about as there is in the summer and of course many of the rivers and lakes are frozen over, so activities such as kayaking are a no go. Without a car it can prove difficult to get to Jasper from Banff as it’s a good few hours away and there’s no public transport. I know some people who have hitchiked but I chose the safer route and booked myself a seat on the SunDog Tours Mountain Connector. Pro with it being the quite winter months? I had plenty of room to stretch out!! 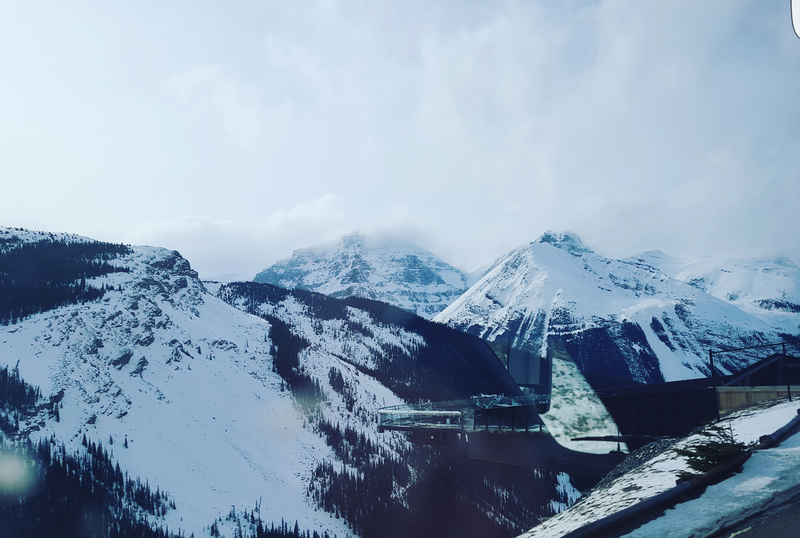 During the warmer months the same tour company offers trips to the Colombian Icefields and the Glacier Skywalk, unfortunately this doesn’t happen in the winter but you do still get an amazing view of them as you pass by! TIP 2: If like me you take the SunDog bus then shotgun a seat on the left handside for the best views! With all the touristy attractions of the mountains, forests and wildlife it’s amazing how Jasper has retained its homely feel, but it has. Friendly smiling locals take pride in their closeness with the nature and wildlife that surrounds them and they are fearcly protective of preserving the unspoiled beauty of this land. If you’re camping in the wrong spots, feeding the wild animals when you’re not supposed to, badgering animals just to get a photo or speeding through wildlife crossings, then expect to be yelled at and rightly so. Respect the nature here as the locals do and they’ll welcome you with open arms. There are fewer places to stay here in regards to hostels with it being such a small town. The main HI-Jasper one is a bit far out so mainly good for those with a car, but they are in the works of proposing a new one closer in. I stayed at a place called World Travellers Fraternity and it was more like a guesthouse than a stereotypical hostel, located in the converted basement area of a house. It is however roomy, homely and run by a lovely couple who are more than helpful with tips and places to go whilst in Jasper. Walking around the town you can spot deer and elk wandering down the rail tracks, or even crossing the roads. As I said wildlife is king here and they have learnt to live alongside the community and people here who respect them. Then on a hike up Old Fort Point was greeted by some curious mountain sheep! Another way if you don’t have a car is to jump on a wildlife tour. I went on one with SunDog and again because of the quieter tourist season, I was the only one on the bus!! This means I got to sit up front and chat and learn so much about Jasper’s wildlife from my knowledgeable guide Dave. We came across a huge herd of Elk! Then had a close encounter with some cheeky looking sheep! Dave explained how at this time of year the lake is known as the ‘disappearing lake’ because it literally drains away. This is due to an underground river system that empties in the winter, thus leaving gaps for the lake water to vanish into. The result is this magnificent landscape of shimmering white. In the winter the Malign Canyon opens up as the rivers waters dissappear and freeze over. What was once a vast deeper river in the summer becomes an icey Canyon wonderland you can explore (with caution). Frozen waterfalls and huge icycles make for a spectacular walk. I went with SunDog Tours and was once again the only visitor, another private tour for me yay! 😄 It was useful to go with them as they pick the safest times to go, paths to take and provide you with the appropriate footwear. 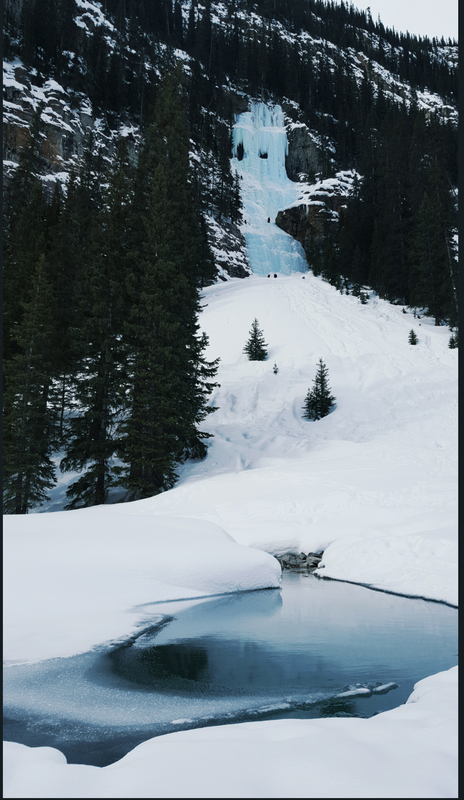 Canada has had an especially warm winter this year and this is evident by the melting ice and snow around Jasper. It also meant that the evening Ice Canyon walks were not running due to the thawing and that they would most likely be closing off the Canyon in another week or so, so I got there just in time! You might think that in the winter the trees in the park will be bare, everything covered in snow and all of the rivers would be frozen over. Wrong! The evergreen forests remain vibrant and green, the weather is still good for walking and many of the rivers are fed by underground warmth waters, so remain flowing. I did drink a bit of the water here too.. not as cold as Lake Louise water but still fresh and crisp! It’s vivid emerald green waters are truly an incredible if not worrying sight. The last point I wanted to make for coming to Jasper in the winter is of course there will be hugely less footfall. The bears are hibernating and many of the park grounds are closed, so the millions of crowds that usually traverse the park in the summer aren’t there. I loved this. Less annoying throngs of people trying to get a selfie with a bear (don’t do that it’s dumb), peaceful hikes and cheaper rates. Brilliant! Banff National Park in Alberta has to be one of the most beautiful places in the world. Sparkling lakes, dramatic mountains, rolling hills of pine trees, wildflower and waterfalls, not to mention it’s rich wildlife. Established as a national park in 1885 it is Canada’s oldest national park and attracts millions of visitors every year. 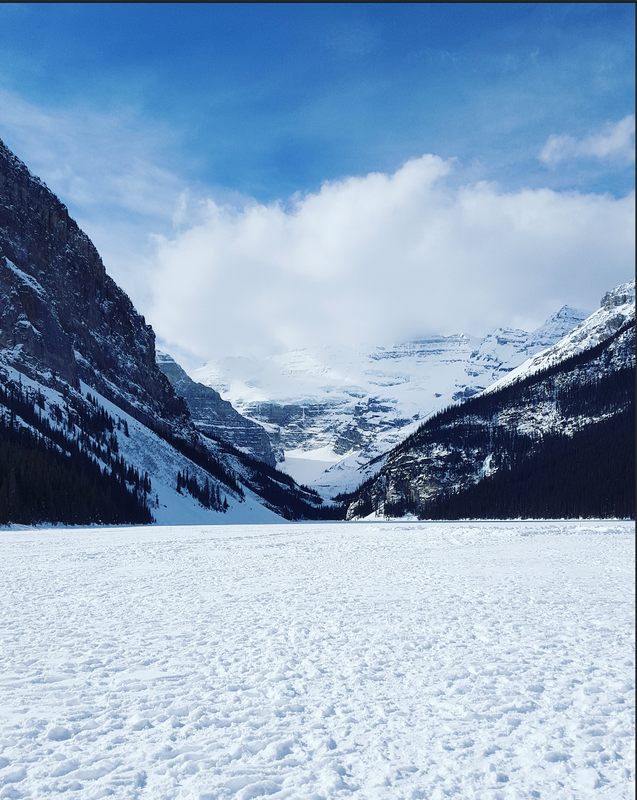 The sheer beauty and magnificence of the mountains have been capturing the hearts of travellers since the dawn of time and the Canadian Rockies showcase some of the best in the world. 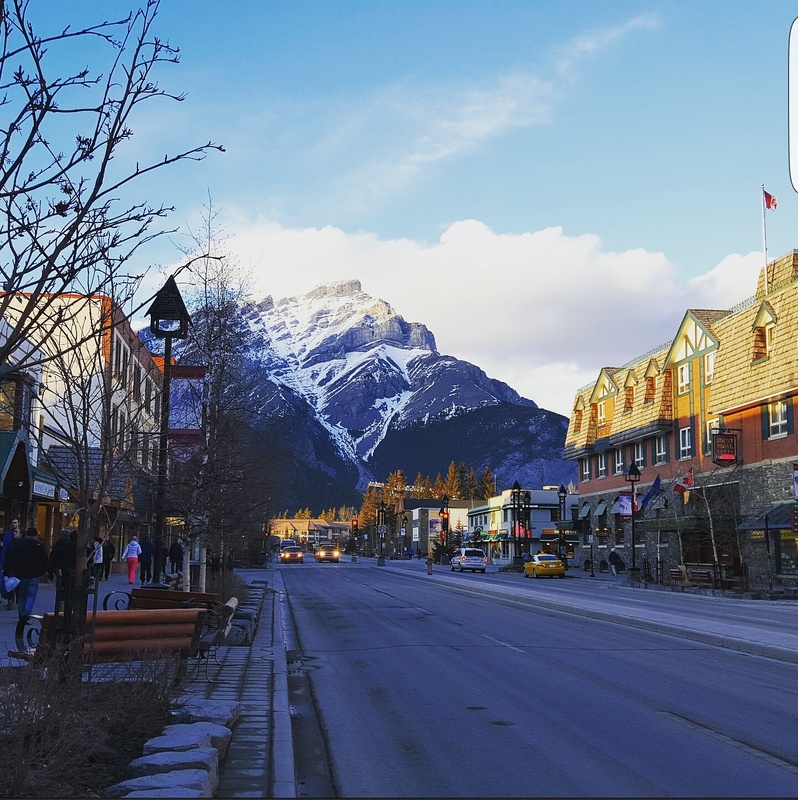 Banff town is situated amidst Mt. Rundle, Cascade Mountain, Sulphur Mountain and Mount Norquey, so no matter where you look your eyes are soon greeted by magnificent snow kissed peaks. Waking up and opening your curtains to these kind of views surely never gets old. Unfortunately I didn’t get to spot any in my brief time here, but Banff National Park is abundant with wildlife! It has 53 species of mammals roaming it’s green forests, with deer being know to wander right into town and surprise drunken backpackers on their way back home! If you keep your eyes peeled on the drive from Banff up to Lake Louise, this is meant to be a good time to spot animals such as deer, elk and even bears and moose. To reduce animal fatalities on this busy highway they have put a fence all along it, with animal overpasses and underpasses. These animal crossings allows the wildlife to cross safely and roam free. Clever right! By far one of the greatest attractions of Banff National Park. Lake Louise is that place on all the Canadian Rockies postcards. You know the one of the magical emerald lake, overshadowed by great snowy mountain peeks? Unreal. Except of course this time of year it’s all frozen over! The frozen lake however brings it’s own enchanting beauty, you can walk on it! Walking across the lake really is an amazingly unique experience. I went from one side to the other and the whole time was in such awe of the mighty surroundings of the mountains. Towards the far side of the lake, on the right hand side, there is a spectacular frozen waterfall. You can spot a few ice climbers clambering up its emerald face and just stand and take in all of nature’s wonder. Banff is very much a tourist and a party town. Backpackers, weekend trippers, winter sports enthusiasts and the odd local all mingle together in a bustling hub of enjoyment. Whether it be a quiet few down the Irish Bar, cheap beer at your hostel wateringhole or a night of boogying at the Dancing Sasquach, there’s something for everyone here. As Canada’s oldest national park, Banff has a rich history of how it was first found and explored, as well as its development and battles with protecting it’s unique nature. 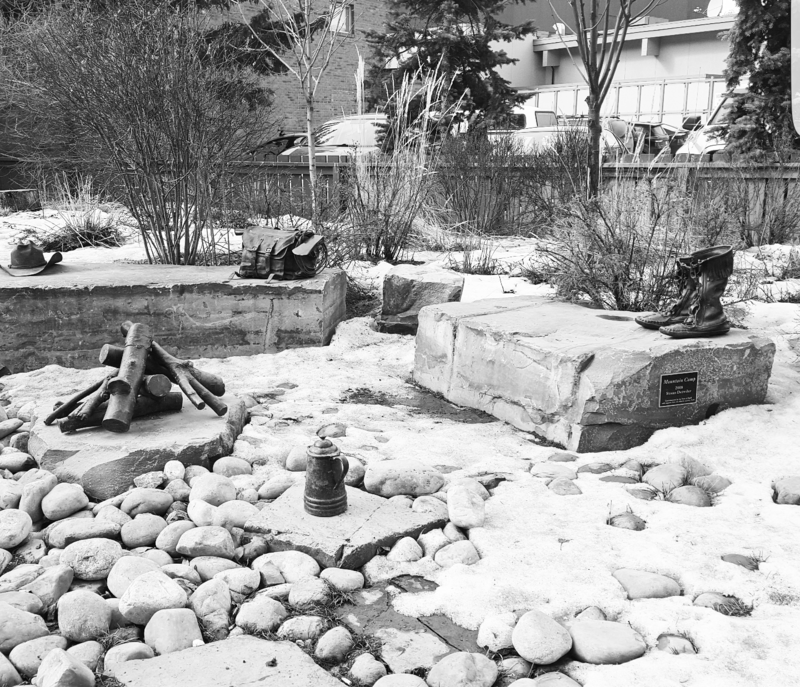 If you take any of the tours (I used Discover Banff) then the guides are very informative about this kind of history. This is the big one. 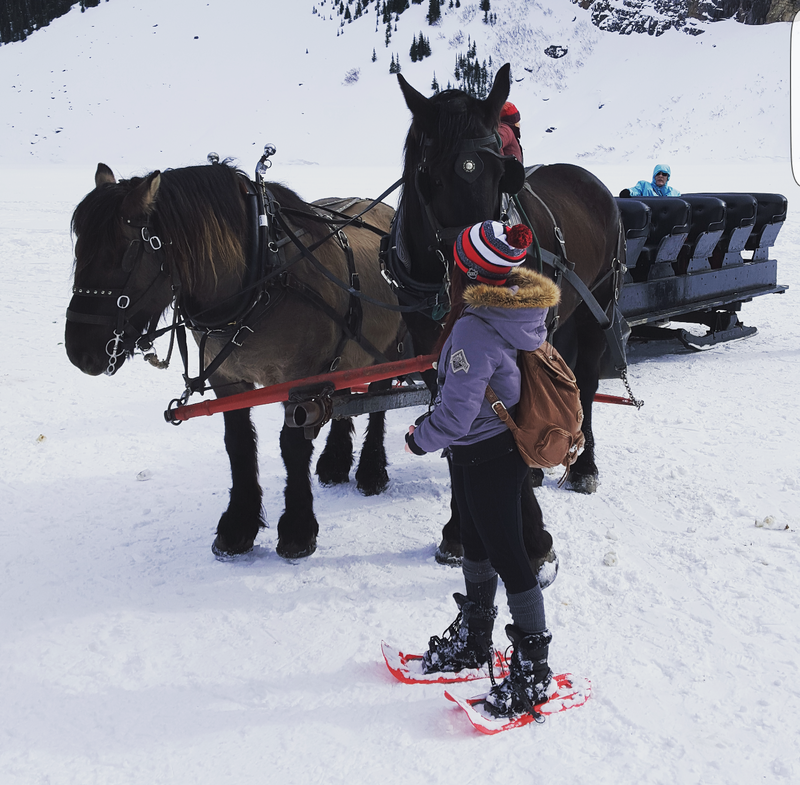 Visitors arrive in flocks during the winter season to make the most of the mountains skii and snowboarding season. Lake Louise Skii Hill is a particular popular area, with views overlooking the lake and buses leaving regularly from the town. 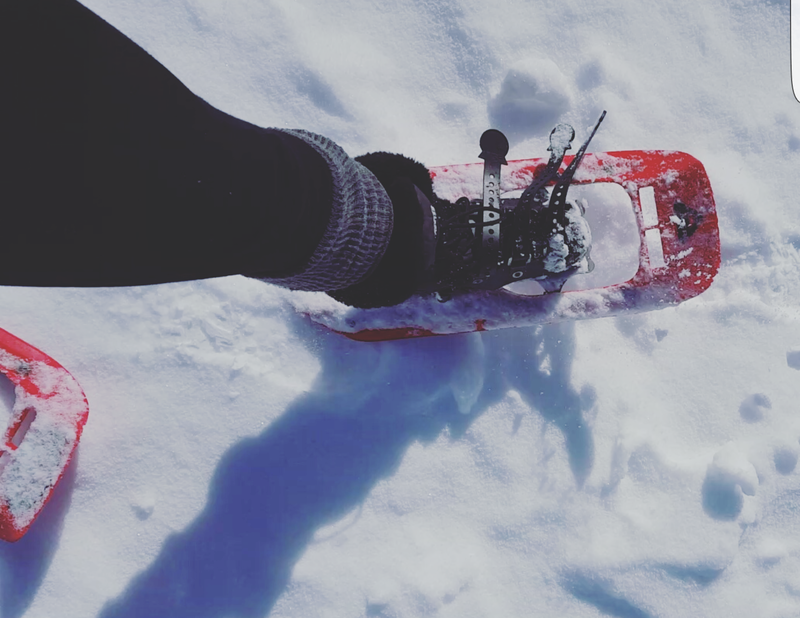 Aside from skiing and boarding, you can also try dog sledding, snowshoeing, snowmobiling, hiking, ice climbing, ice skating and more. During the summer kayaking, canoeing, fishing, golf and more hiking trails all open up to enjoy. 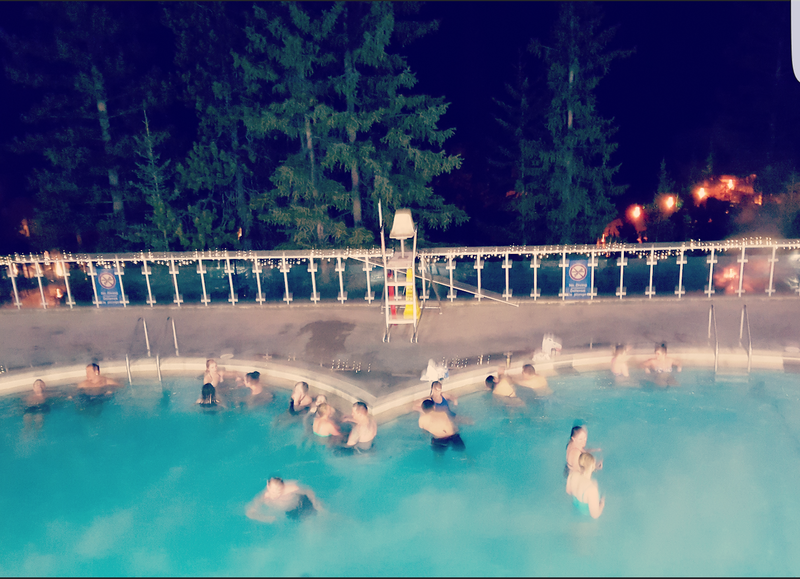 The closest hot springs to Banff are the popular Banff Upper Hot Springs. If you’re coming from the centre of town these heated pools are just a quick drive from Banff Avenue, hop on the 1 Roam bus toward Sulphur Mountain if you don’t have a car. In the daytime there is a lovely view across to Mount Rundle and in the evening it’s a good way to ease those achey muscles after an adventurous day.